The Oxigen Masters of Landscape Architecture Scholarship 2017 has been established by School of Architecture & Built Environment to support postgraduate coursework students undertaking first year Masters of Landscape Architecture program of study at the University of Adelaide. Applicants must be able to demonstrate genuine financial need. One scholarship is available for one year will be available to a student who enrols full time in a Commonwealth supported place at the University of Adelaide. For the purposes of the scholarship, students undertaking 75% of a full course load are considered to be enrolled on a full time basis. 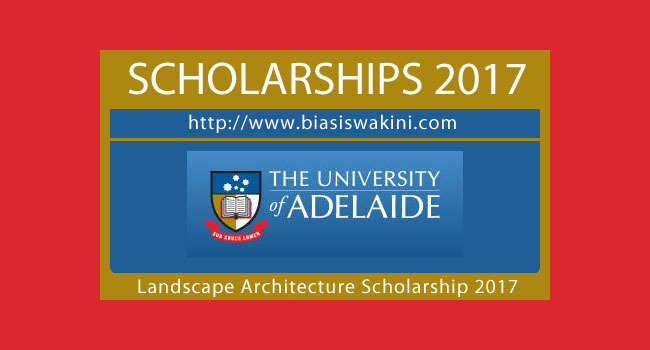 Applicants must be undertaking the first year of the Master of Landscape Architecture program at the University of Adelaide. Selection of the successful candidate will be made according to academic merit and financial need. Academic merit will be determined by Grade Point Average or equivalent scores. 0 Komentar untuk "Oxigen Masters Of Landscape Architecture Scholarship 2017"